American Wolf: Red Headed Stranger: An Appreciation. Red Headed Stranger: An Appreciation. This past week, I had the honor of seeing Willie Nelson receive The Gershwin Prize For Popular Song from The Library Of Congress. As is usually the case, a long parade of music stars sang his songs & praises in a display of the songwriter's breadth & influence. Midway through the show, Paul Simon paid tribute to Nelson's vastly influential 1975 LP, Red Headed Stranger, & called out Edie Brickell to sing a duet with him on one of its most famous songs: "Remember Me." It was a lovely rendition & the vibe of the crowd definitely dug it. There was only one problem. As the song ended, I turned to my wife & said, "Am I jerk to point out that Willie Nelson didn't actually write that song?" Indeed, Willie Nelson has written countless country standards & was long overdue for the Gershwin Prize. But he is also the rare songwriter where for every classic song he's written--"Crazy," "Funny How Time Slips Away," "On The Road Again"--there's another classic he's associated with that he didn't actually write--"Blue Eyes Crying In The Rain," "Always On My Mind," "Georgia On My Mind"; & "Remember Me" falls into the latter category. This distinction was probably missed by most of the crowd (especially as other non-penned Willie classics like "Pauncho & Lefty" & the aforementioned "Georgia On My Mind" were performed), but it lies at the heart of Willie's finest music: His work is so simple & so classic, that he can take any song & make it his own in a way that is nearly unique among American singers. Others who had this ability--Frank Sinatra & Elvis Presley, as well as Nelson's close friends & frequent duet partners, Johnny Cash & Ray Charles, among others--often did so with a sense of bombast & flair, a voice that reached to the back of the crowd or was filled with dazzling accentuations. Willie Nelson is not like that. He has a fine voice, but not what you might call an outstanding one, & even as he draws you in, it's not with the intrigue of a Billie Holiday or a Bing Crosby. He simply sings the way he feels, & you can take it or leave it. Red Headed Stranger is his finest album & it epitomizes this trait. Out of the 11 songs on the LP, Nelson wrote only 4 of them & none of them are a complete song in a traditional sense: "Time Of The Preacher" is broken up into themes, "Blue Rock Montana" & "Denver" are little more than 1-minute sketches that set the scene for the story, & the closing "Bandera" is an instrumental. All the other songs on the album, which includes its most famous songs--"Blue Eyes Crying In The Rain," "Remember Me," & even the title track--came from the pen of others. Yet Willie Nelson makes each song his own such that learning this fact is not just an interesting aside, it's a jarring shock. Red Headed Stranger is a very special album. Coming at a time when the concept album was self-imploding less than a decade after the course was charted by The Beach Boys' Pet Sounds & The Beatles' Sgt. Pepper's Lonely Hearts Club Band, Red Headed Stranger beat the game by sidestepping it. The LP had all of the hallmarks of a concept album--a central story, musical themes, a consistency of quality that held for its length--but left the synthesizers, orchestras, & other histrionics for the fools. A month before Red Headed Stranger was released, progressive rock reached its nadir with Rick Wakeman's The Myths & Legends Of King Arthur & The Knights Of The Round Table, which he infamously staged as a live rock & roll ice show. If Red Headed Stranger had any precedent in rock, it was Bob Dylan's 1967 LP, John Wesley Harding. Dylan's first release since Sgt. Pepper, he hired Gordon Lightfoot's backing band & lay down 12 stripped-down tunes that played like a set of mysterious parables with no refrains to hold onto. He would later call it the first Bible-rock album, but critic Paul Williams would be just as telling when they wrote that it was as though Dylan had gone back down South & re-imagined how rock & roll might have sounded just days before Elvis made his first record. Indeed, this is the mood that frames Nelson's record; just listen to how the opening notes of "Bandera" echo Elvis's "I'll Never Let You Go (Little Darlin')," his final exercise in that weird pre-rock sound of "Harbor Lights" & "I Love You Because." But even more than any album that either Dylan or Elvis would ever cut, Red Headed Stranger holds together conceptually. To my ears, it easily outclasses the muddled studio version of The Who's Tommy & Pink Floyd's overrated The Dark Side Of The Moon, & has a fair shot at being the finest concept album ever conceived. Probably only Marvin Gaye's What's Going On & Frank Zappa's We're Only In It For The Money could beat it. This is because, unlike even those two albums, Red Headed Stranger is a statement of rare focus & restraint. The band never grows to more than 4 or 5 people & all of it could be performed onstage with no tricks & little amplification. Built around a song cycle of a preacher-turned-murderer, it sounds remarkably timeless; when the opening describes the setting as "The year of '01," it could be 1901 just as easily as 1801. At its heart, Red Headed Stranger is that all-American form of storytelling, a western, told as a badman ballad folktale. Like the American West in the time of cowboys, it is incomplete, some parts seem finished while others seem fleshed out, but there is more than enough to get the story, which is a basic one. A preacher wife's leaves him for another man ("The Time Of The Preacher"). At first he is in denial ("I Couldn't Believe It Was True"), but then resolves to go to town where he shoots them both ("Blue Rock Montana/Red Headed Stranger"). At this point the preacher becomes the Red Headed Stranger, at first reflecting on his lost love ("Blue Eyes Crying In The Rain") & then riding into a new town, where he shoots a woman who tries to steal his late wife's pony ("Red Headed Stranger"). The preacher seems to return, as an instrumental version of the hymn "Just As I Am" closes out the album's first side. & you're judged by the look in your eye. It is there that the Red Headed Stranger meets a lady ("Denver") & proceeds to dance with her, first a waltz ("O'er The Waves"), followed by a country stomp ("Down Yonder"). He asks her to spend the night with him ("Can I Sleep In Your Arms"), before they part ways the next morning ("Remember Me"). Or do they? The album ends with the mysterious "Hand On The Wheel," a song of love & faith that seems to take place in the distant future, its central verse finding an old man & boy fishing together "with a lady that they both enjoy." Is the old man the Red Headed Stranger, the boy his grandson, & the lady the woman he met in Denver? Or is this just a vision the Red Headed Stranger imagines, like he did in "Blue Eyes Crying In The Rain"? The album is unclear, & therein lies at least some of its power. It implies to me that one day this may play out, but it will take a few more affairs & murders before it does. In other words, Side 1 will have to repeat itself before Side 2 can come true. The story can never resolve because the album that contains it is unresolved. It is the rare pop music "song cycle" that is actually a cycle, as continual as the 12-inch vinyl circle it was released on. Many of the album's elements reinforce this sense of unity. The tale of Red Headed Stranger is rooted in threes--over the course of the LP, the "Time Of The Preacher" theme appears 3 times, the Red Headed Stranger kills 3 people, & the 3 named characters--Red Headed Stranger, Little Lost Darling, & Yellow Haired Lady--have 3 words each. Even the Red Headed Stranger's home--Blue Rock, Montana--is always given as 3 words. Furthermore, sets of 3 fill the album. "Time Of The Preacher" begins with the love triangle of the Red Headed Stranger, the Little Lost Darling, & her lover, all of whom are brought together in the "Blue Rock Montana/Red Headed Stranger," where the Red Headed Stranger kills them both. The Red Headed Stranger travels in 3, with himself, the Raging Black Stallion, & the Dancing Bay Pony (even the horses have 3 names). & the album ends with a vision of an old man, a little boy, & a lady that they both enjoyed in "Hands On The Wheel." Just as important as threes is the use of eyes. From the album's biggest hit--Nelson's signature "Blue Eyes Crying In The Rain"--down through the subtle actions in the songs, eyes are everywhere. In "I Couldn't Believe It Was True," tears fill the Red Headed Stranger's eyes; in "Blue Eyes Crying In The Rain," the tears are now in his Little Lost Lady's eyes; the title track finds the Yellow Haired Lady casting greedy eyes on the Dancing Bay Pony; in "Hands On The Wheel," the Red Headed Stranger looks into a woman's eyes & finds himself in her. & of course in "Denver," the land is celebrated for the ability to judge someone by the look in their eye. 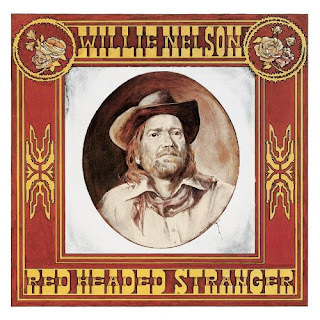 The simplicity of the music & the straightforwardness of the lyric convincingly tell the story of the Red Headed Stranger, which in turns seems to tell a story about the album's artist, Willie Nelson, as implied by the Red Headed Singer's face on the cover. His understated style makes it feel like he is singing right to us, & much of the album is just voice & acoustic guitar. When there are flourishes, they are often appropriately thought out. Take the piano in "Red Headed Stranger," which appears immediately after the word "tavern" & continues through the part of the song that takes place in the tavern, as though it is a soundtrack to embellish the lyric; by the song's final refrain, which takes place outside of the tavern, the piano has disappeared. This sense of unity & directness is all the more impressive when one considers that Nelson wrote only a third of the album's songs, none of which were complete or except for an instrumental. "Blue Eyes Crying In The Rain" was a Roy Acuff song from 1945 that Hank Williams would record in 1951. "I Couldn't Believe It Was True" was penned by Eddy Arnold, "Can I Sleep In Your Arms" was written by Hank Cochran, & "Remember Me" was written by Melba Mable Bourgeois. All of the instrumentals except for Nelson's own "Bandera" were at least 50 years old; "Just As I Am" & "Over The Waves" both dated from the 19th Century. & most astonishingly, "Red Headed Stranger was released in 1954 as a single by Arthur "Guitar Boogie" Smith. So in the end, Nelson didn't so much write a song cycle as he did cobble one together from existing parts--a patchwork quilt that looked like a tapestry. Tellingly, it was his flourishes--"Time Of The Preacher," "Blue Rock Montana," & "Denver"--that held it all together, moving the story along through songs that otherwise came from very different places, styles, & perspectives. By taking old existing parts & reinventing them in his own image, Willie Nelson made an album that was not only American in sound but also in its execution. E pluribus unum reads The Great Seal Of The United States--out of many, one. The same could be said of Willie Nelson's Red Headed Stranger, the album, & the singularity through which he focuses its outlaw tale. The 100 Greatest Beatles Songs Of All-Time.